Additional to various international maneuvers the rotation and supply of the NATO enhanced forward presence (eFP) in the Baltic states is a logistical priority. This also applies to the German Federal Armed Forces, which had led the NATO Battlegroup Lithuania since 2017 out of the military base in Rukla with the participation of troops from Belgium, France, Croatia, Luxembourg, the Netherlands and Norway. In this framework the supply chain via the seaport of Klaipeda (Klaipėdos valstybinis jūrų uostas) plays an important role as the local transport destination and sea port of debarkation (SPOD) plus the transit port for handling large military equipment and weaponry. Such transport projects which also may be carried out as part of intermodal transport regularly confront security experts around the globe with major challenges due to transnational specific requirements. 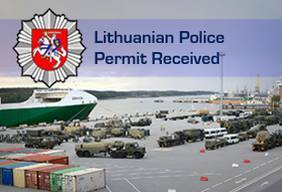 As a specialized international security service provider, i.b.s.® has faced this hurdle and with effect from 20.02.2019 has been granted an official and unique permit - issued by the Police Licensing Authority of the Lithuanian Ministry of Interior - to carry out armed protection services on the territory of the Republic of Lithuania, e.g. personal protection and especially within the framework of the transport of military goods. Therefor i.b.s.® is currently the only (!) German commercial security company which is able to secure transports of military goods from Germany to Lithuania in a very comprehensive and professionell manner. Also our company since January 2019 has a coordinating element with our new representative office in Vilnius the capital of Lithuania and with this local site i.b.s.® is able to considerably reduce the administrative lead times associated with military transport projects dramatically.